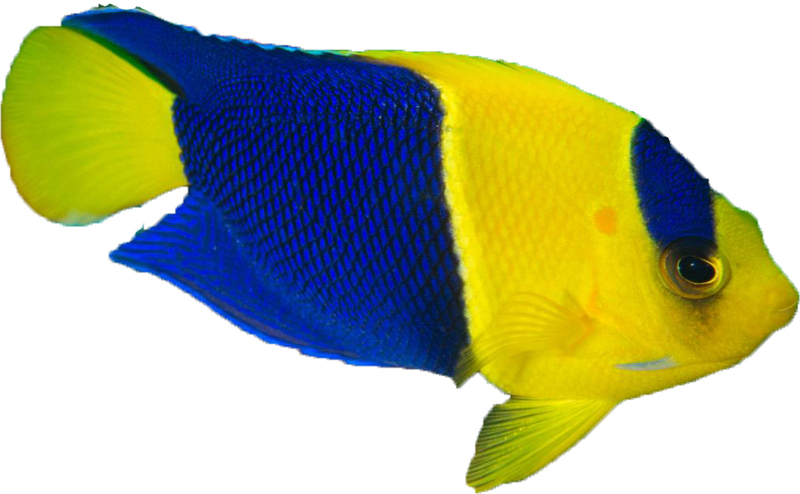 Also known as the Blue and Gold Angel, Pacific Rock Beauty, Oriole Angelfish, Two-Colored Angel, and the Oriole Dwarf Angel. The Bicolor Angelfish is yellow on the front half of its body and blue on the back half. The colors of this fish are striking and considered by some to be the most striking of the Centrotype group. A minimum of a well-established 70 gallon tank with plenty of hiding places and live rock for grazing will provide an idea home. The Bicolor Angelfish is not a great candidate for a reef aquarium, the Bicolor Angelfish is often prone to nip at sponges, trunicates, corals and clams. It is not overly aggressive toward other fishes, if they are all added simultaneously. Add it last to a tank if it is to be housed with other peaceful fish. The Bicolor Angel needs a varied diet to thrive in an aquarium environment, we suggest feeding a high quality frozen food, including mysids, brine shrimp and also vegetation.